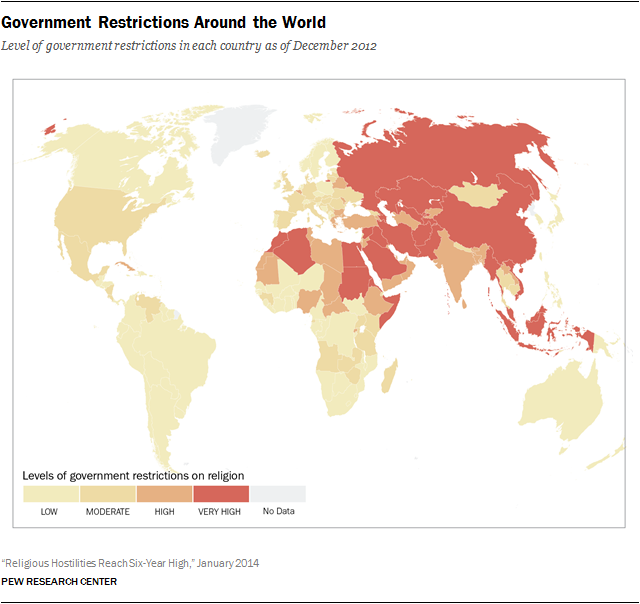 A recent Pew Research study quantified the levels of government restrictions on religion – as well as social hostilities involving religion – in 198 countries and territories around the world. As of 2012, 29% of the nations studied had high or very high levels of government restrictions on religion (according to our measure), with 64% of the global population living in those countries. China has had very high government restrictions on religion in each of the six years of the study (since 2007), and was among the most restrictive in the world in 2012. In terms of social hostilities involving religion, China moved into the “high” category for the first time in the study in 2012.